When people learn how to cook chicken livers correctly, many tell me they never realized how good they taste. The favorite way is to fry them crisply. I use the same chicken seasoning that I use to fry chicken, mix it with flour and fry them in a skillet. They cook very quickly and the flavor is fantastic. Learning how to cook chicken livers will lead you far beyond simply frying them. Below I am giving you a selection of my favorite recipes. Not only do they taste good, but chicken livers are the cheapest part of the chicken allowing you to prepare a good meal for your family at a reasonable price. A lot of people will tell you they don’t like to eat chicken livers because of the high amount of cholesterol. Although this is true, we do not want to overlook the healthful supply of iron and zinc which they contribute to our bodies. Chicken livers are also a wonderful source of the B vitamins and others. As you can see, while it might be a good idea to limit how often you eat chicken livers, it is not so wise to eliminate them altogether from your diet. In small saucepan simmer brandy until reduced to 6 tablespoons; set aside. Sauté green onions and livers in ¼ cup butter until livers are done. Spoon liver mixture into container of food processor. Add brandy, whipping cream and seasonings to processor; process until smooth. Add 1 cup of butter to processor and process until blended well. Spoon pate mixture into lightly oiled 5 cup mold; chill at least 3 hours. Unmold and garnish if desired; serve with crackers. 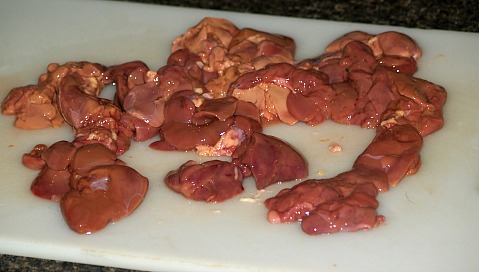 Cut liver into 1 inch pieces; rinse thoroughly with cold water and let set to drain. Combine and mix flour with salt, pepper, thyme, garlic, oregano and parsley. Brown bacon in large skillet; remove from skillet and cut into pieces onto plate. Add onions and green peppers to skillet and sauté until tender; remove to bacon plate. Add more fat to skillet; dip liver pieces into flour mixture and place in skillet. Brown liver pieces on both sides; remove to plate with bacon and vegetables. Add more fat if needed to skillet making about 4 tablespoons. Stir into fat about 3 tablespoons of remaining seasoned flour until blended. Add to the skillet the tomatoes, wine and water; stir until blended. Add to skillet the plate of livers, bacon and vegetables; stir until blended. Place 1 cup of cooked grits on each dinner plate; spoon liver mixture over top. Learn how to cook chicken livers to make a simple meal of rice and mushrooms. Sauté chicken livers and mushrooms in 3 tablespoons melted butter in a large skillet until done. Remove livers and mushrooms from skillet to plate; reserve pan drippings in a small bowl. Sauté rice in 3 tablespoons butter until golden brown in skillet. Add beef broth, mushroom soup, sherry and reserved drippings to rice; stir well. Cover skillet and simmer about 20 minutes or until liquid is absorbed. Stir livers and mushrooms into the rice mixture; cook until thoroughly heated. 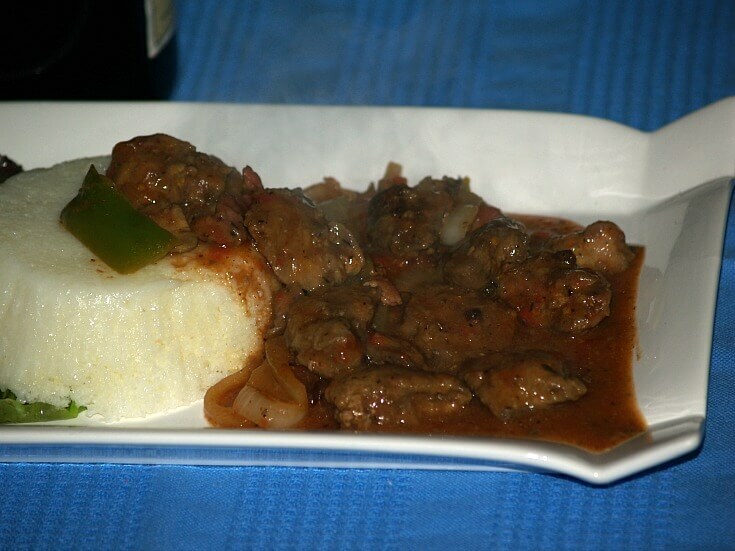 Learn how to cook chicken livers Polyensian style. 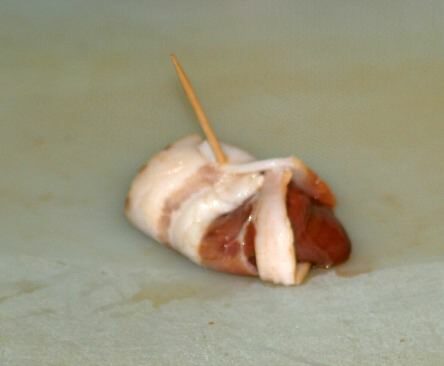 Cut chicken livers into 1 inch pieces. Combine soy sauce, wine, ginger and garlic in an 8 inch square baking dish; stir well. 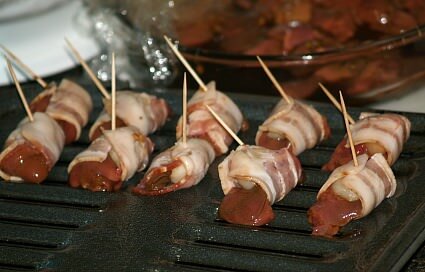 Place chicken livers in soy sauce mixture; cover and marinate in refrigerator for 2 to 3 hours. Cut water chestnuts in half. 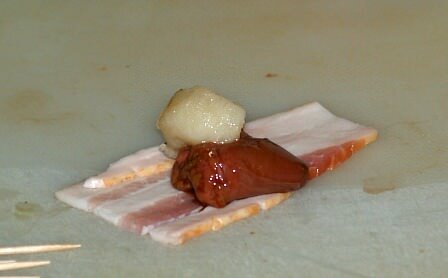 Place a water chestnut half and piece of chicken liver on each piece of bacon. Roll up bacon and secure with a wooden pick. Arrange on baking sheet and broil 4 inches from heat 3 minutes on each side until bacon is done. 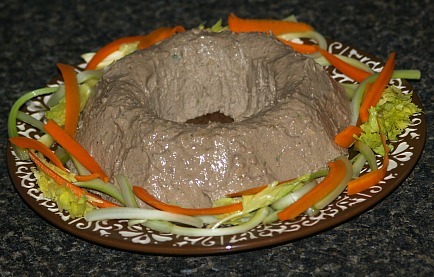 NOTE: Below you can learn how to cook chicken livers in the microwave using the Rumaki recipe. Follow above directions until ROLLING AND SECURING WITH PICKS. Arrange the rolls on paper towel lined microwave platters; about 1 dozen on each. Cover the appetizers and refrigerate up to 2 hours. When ready to microwave, cover platters with paper towel. Microwave each platter on HIGH for 4 ½ to 7 minutes or until bacon is crisp and liver is done giving each platter one half turn. This recipe will teach you how to cook chicken livers making a delicious omelet. Wish eggs, water and salt together in a medium bowl only until well blended. Slowly heat butter in a 9 inch skillet or omelet pan; turn egg mixture into pan over medium heat. As omelet sets run spatula around edges to loosen; tilt pan to let uncooked portion to run underneath. Continue tilting and cooking until omelet is almost dry on top and golden on the bottom. Add filling, fold in thirds and remove to plate. To make filling sauté bacon in skillet over low heat until crisp; drain on paper towel. Crumble bacon and measure 1/3 cup. In same skillet over low heat sauté chicken livers until done; remove from pan and chop finely. Add onion to skillet and sauté until tender; drain fat from skillet. Add bacon, chicken livers, salt and pepper; reheat gently, then cover and keep warm. PREPARE 4 basic omelets of recipe above; place ¼ cup of filling in center of omelet. Fold omelet in thirds and remove to serving plates; garnish with chopped parsley. Heat butter in a large skillet; sauté onion and parsley 5 minutes. Add chicken livers; cook stirring occasionally about 8 minutes. Stir remaining ingredients into drippings of the skillet; bring to a boil. Pour over livers; serves 6. This is how to cook chicken livers fried to perfection. Dredge livers in flour mixture. 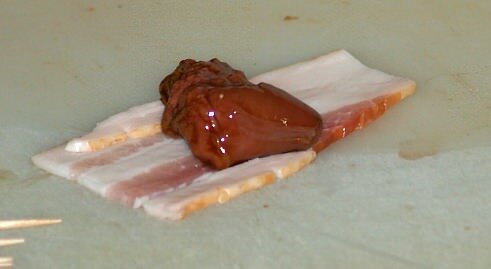 Fry livers in deep hot oil (350F degrees) for 3 minutes or until golden brown. 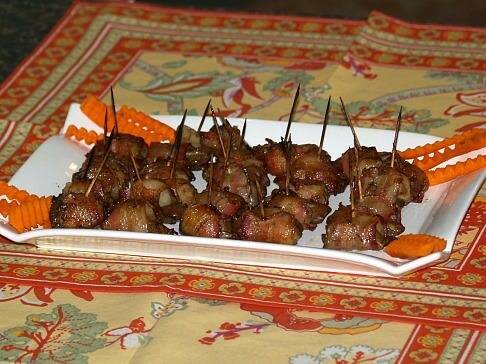 Drain livers on paper towels; serve immediately with plum sauce (below). Combine all ingredients in saucepan; cook until thoroughly heated. Serve hot or cold; store in refrigerator.